Ants, through their Borg-like powers, are capable of performing complex cooperative feats that make solitary insects look useless. 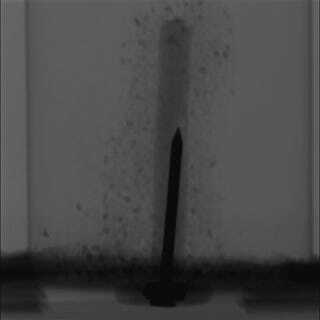 In an extraordinary example of this collective behaviour, researchers have shown how fire ants, when confronted by a barrier, swarm together to create towers with their bodies, allowing the lucky few at the tip of the structure to escape. Fire ants are famous for building massive ant towers, which allow them to escape or migrate into otherwise inaccessible areas. New research published in Royal Society Open Science details exactly how the ants build and maintain these perpetually sinking structures. They do so autonomously, in the absence of any centralised coordination. Instead, they rely on a simple set of rules that, at the group level, results in the construction of a tower. This hive-mind behaviour may not help each and every ant involved, but it’s a classic case where the needs of the colony outweighs the needs of the one. This latest study is a follow-up to 2014 research, in which the Georgia Tech scientists demonstrated how ants use their bodies to build life rafts. 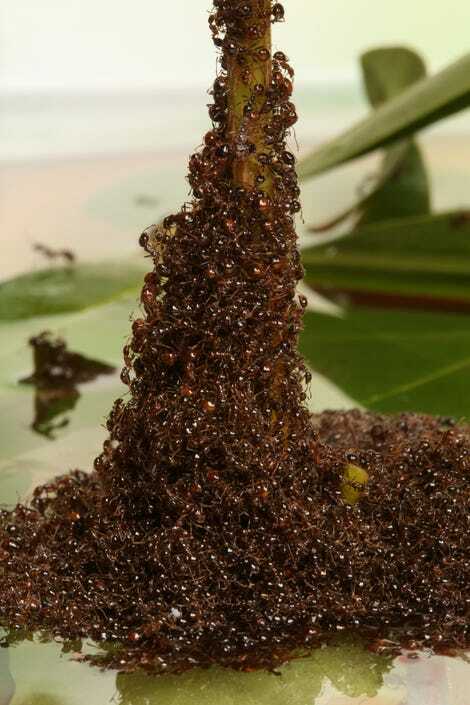 The tower-building fire ants do a similar thing, searching for an empty spot in the structure to inhabit. Once an ant finds a space—typically near the top of the tower—it stops moving, allowing another ant to climb on top. And so on and so forth, the tower grows vertically. 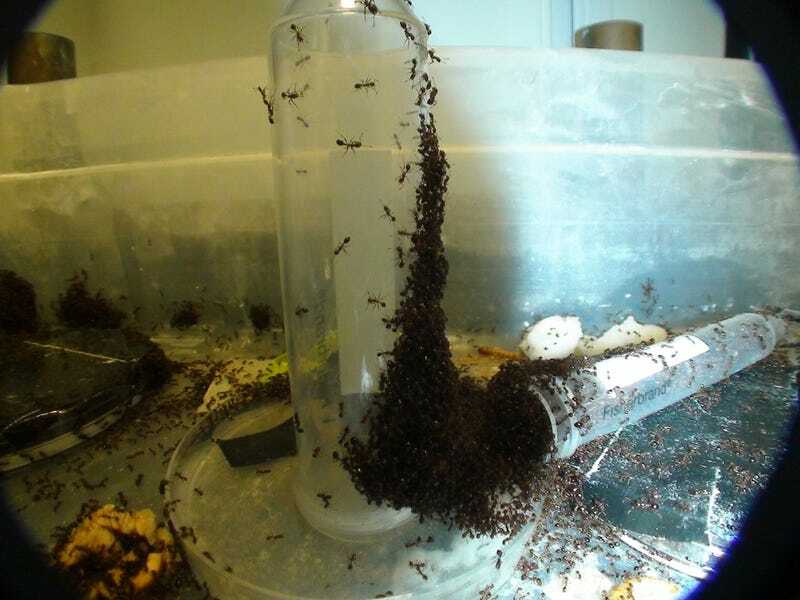 The Georgia Tech researchers documented these behaviours by setting up a lab experiment in which a colony of fire ants were placed in a dish, and forced to attempt an escape up a pole (the sides of the dish were laced in talc power to make it impossible for the ants to climb out). As the tower grows taller, it also gets wider. The weight of the structure is supported by a wider cross-section at the base, allowing the ants to smartly distribute their weight. Each ant can withstand about 750 times its body weight without injury, according to the researchers, and they’re most comfortable supporting three ants on their backs. Any more than that and they give up, breaking their holds and scuttling away. Georgia Tech’s David Hu, the lead author of the study, along with co-author Craig Tovey, a professor in the Stewart School of Industrial & Systems Engineering, discovered—by accident—that the column sinks as the insects work. At that speed, the movement of the ants looked totally different. To confirm the sinking behavior, Tovey and Hu contacted experts at at Lawrence Livermore Labs and other institutes. They were told that the technology did not exist to track individual particles in the interior of a three-dimensional object, at the time and size scales of ant-made towers, without killing the insects. But when they talked to an expert at Georgia Tech, they were referred to Daria Monaenkova, a postdoctoral researcher working in Dan Goldman’s physics lab. Monaenkova, who would subsequently become a co-author of the new study, happened to be working on an x-ray technology that would enable the researchers to peer inside the ant tower itself. Monaenkova worked with the researchers to get the right amount of radioactive iodine that could be ingested by the ants to make them more visible to the x-ray device, but not enough to be seriously toxic. With the sinking behavior confirmed by Monaenkova’s method, Hu and Tovey sought to uncover an explanation. Unexpectedly, it seems the sinking is actually necessary to the maintenance of the overall structure. Using this method, an individual ant can rest for upwards of an hour, and then rejoin its comrades in the structure once it’s ready. Consequently, the ever-changing tower can last for hours—and possibly even days if need be. Tovey likens the behavior to fish who school in rivers as they swim upstream. These fish do what a team of bicycle riders do: they take turns being at the front of the school and taking the brunt of the current. Then the ones at the front peel off and go to the back of the school, and so on. Tovey speculates that the ants are basically doing the same thing.